The Cement Irrigation Gate Company (575) 404-3289 - Cement irrigation gates for flood irrigation, water control, and water diversion. The Cement Irrigation Gate Company makes cement gates for irrigation ditches. We make turnout gates, checkgates, and distribution boxes. Our gates have a cement headwall, 5 ft. of pipe, and a 16 gauge galvanized slider (gate). 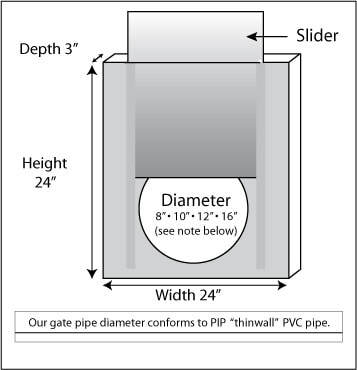 We make gates with 8", 10", 12" or 16" PIP "thinwall" PVC pipe. We also sell replacement sliders. If you have a gate but just need the metal slider we might be able to help you. Download the pricelist to see slider sizes. For pricing go to the Gate Sizes and Prices page on this website or click on the file below to download our price list.